In Ojai, California, you will find a little shop called Kingston Candy Company. I love a good candy store, so I walked in and took my time looking at the shelves of glass soda bottles, vintage candies, modern candies, and so on. But what I took with me to the cash register were three chocolates, all from Californian companies--plus two rolls of Smarties. Now that's good findings. The first of these companies is Twenty-Four Blackbirds Chocolate. I'm not sure for how long this company is around, but it seems to be fairly new. While their website is still in the works, it does have a good slideshow on how they make their chocolate; it's also a nice intro for newbies to the process. I noticed on the bar's wrapper that this company is bean to bar; they also claim, on their website, to be the only bean to bar company in Santa Barbara. Forget Santa Barbara, there are only so many bean to bar companies in the country. Yet while it is a significant fact that Twenty-Four Blackbirds works straight from the cacao beans to the final chocolate bars, that in itself does not say anything about quality. It's implied that if a company cares enough to work with the cocoa beans, they will also care enough to create quality, but unfortunately that is not always the case. You will be happy to learn, then, that this company has started on the right footing. The name is easy to remember, unique, and not obvious (like all the names that start with "Choco"). The packaging is beautiful. Recycled brown paper (hello, environmental friendliness) is printed with black silhouette designs; this one has rows of blackbirds (I counted 44 and a half) sitting on telephone lines. It's simple, rustic, and industrial all at once; it's modern. I can see a bar like this for sale not only in a candy store but also in a hipster coffee shop, a stationery store, or any place with food. The reason that I only got one of the skinny, 14 gram bars was that, naturally, the larger bars were $10--and I didn't feel inclined to spend that much on a whim on a company I had never heard of before. 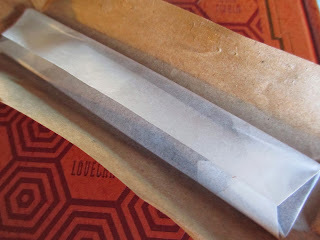 The bars are hand-wrapped in parchment paper inside the brown paper. When you remove these wrappings, you find an even greater surprise: the bar is molded with a feather imprint to go with the blackbird theme. I was not expecting that; I love that, once again, Twenty-Four Blackbirds went in a new and unique direction. Here is where I got the idea of a stationery store: long feathers always remind me of quill pens. Instead of cutting up the feather into a few pieces, the bar is divided just once in the middle. And can I express to you just how beautiful this chocolate is? It's tempered and molded perfectly. There are only three of the tiniest air bubbles, the back of the bar is just as smooth as the front, all the thin lines in the feather came out just right, and the bar shines with just the right quality. This is art. If you have ever worked at all with chocolate, you know that this is not easy to achieve. Not only does the chocolate snap nicely, but the broken chocolate also maintains the same solid brown color, as opposed to chocolates that look whitish where they are broken. Fourteen grams of chocolate like this is nothing to complain about. On first taste, it is bitter. It has a 75% cocoa content, but I would definitely say it tastes on the bitter side of 75%. But here's the thing: there are only cocoa beans and sugar in the ingredients list. So there is no vanilla and, I assume, no extra cocoa butter. It makes sense, then, that this bar would be a tad more on the bitter side. But bitterness in itself is not a bad thing; I am reminded of Patric Chocolate, which I tasted years ago when they were still a very new company. This company (I'm pretty sure it was this company) wrote something about how bitterness can complement chocolate like it does with a fine wine (unless it was a different kind of alcohol). And now when I look up that chocolate, I find that it was, like this one, from Madagascar. That is, the cocoa beans used in both bars were grown in Madagascar. Specifically, these are organic beans from the Ambanja area, just like one of Guittard's bars. So once you move past the bitterness, the recognizable fruity Madagascar notes come in. Chocolate with a Madagascar origin tends to be my, and many other people's, favorite. Even though there is initial bitterness, the notes that take over are light with all their fruity and citrusy aroma. There was also something softer underneath that increases as you approach the chocolate's finish; I wanted to call it an almost banana taste, but the Blackbird website calls it cream. That makes more sense. I wouldn't say that the flavors in this bar are quite as developed as those in one of the much-admired Amano bars. But I'm impressed, and I don't say that lightly about chocolate. The smoothness of the chocolate, along with the flavors that I came across, means that it was very carefully developed. This is very good chocolate--and I like that the packaging doesn't force itself on you. You're left to, on your own, discover the level of quality and the type of ingredients. I don't want to be told how many certifications a chocolate is; I want to taste quality and to know that with that quality come certain necessities (organic, attention to the environment, et cetera). This is how a chocolate experience is supposed to be.